SRAM’s new RED eTap system is getting a lot of positive press, and FSA is showing a prototype wireless group at the show as well. Wireless shifting has the potential to have a big impact on the design of racing/sport oriented bikes, but I’ll save that discussion for another post. 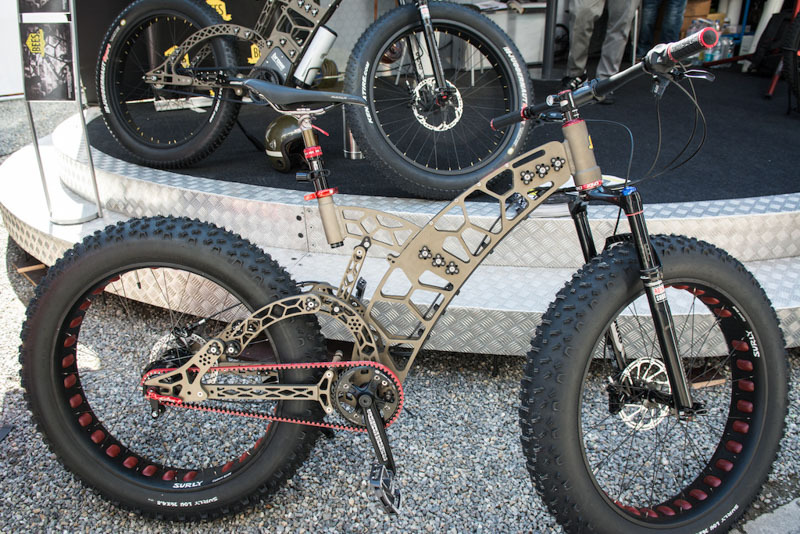 Today three interesting bikes that caught the attention as I have been browsing online galleries and following the #eurobike hashtag on Twitter the last few days. First is the Tern Cargo node. The folding bike company teamed up with Xtraccyle to create a longtail version of the Node that will retail for about $1800. 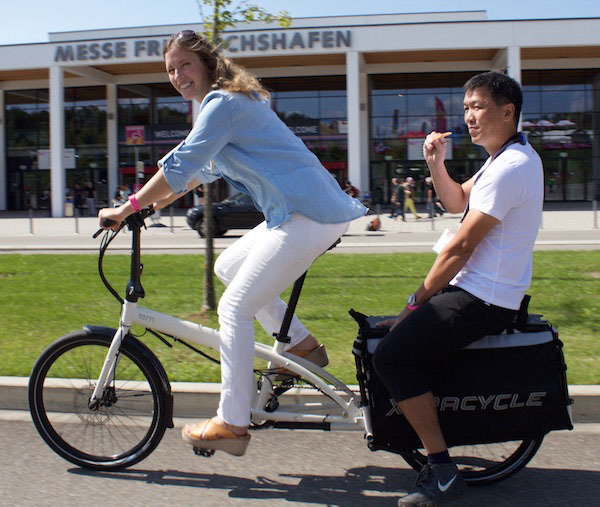 Tern calls it, “a game changer if you live in a city or just want more portability from your cargo bike.” They designed the bike to fit in an elevator, so you can easily take it up to a high-rise apartment or office. The option to fold is also a plus for transit riders, as it can be done with a load of cargo on the rear rack. German company Altinsoy Manufaktur is showing the Bees Bike, a very unique modular mountain bike with a belt drive and internal gearbox. According to a recent GizMag post: “The bike adjusts around the rider through an integrated system of bolts and mounts. In this way, the bike can adjust to better fit your body and riding style. Of most interest is the stabilizer bar that can be swapped in for the DT Swiss rear shock, creating a fully metal hardtail in place of a springy pivoting rear triangle.” I am not sure about that feature (why not just lock out the rear shock? ), but I do think the frame is interesting and I like the way the gearbox is integrated. If this is a first bike design from Altinsoy, I am looking forward to seeing its evolution. The final bike I want to mention isn’t really a bike at all. 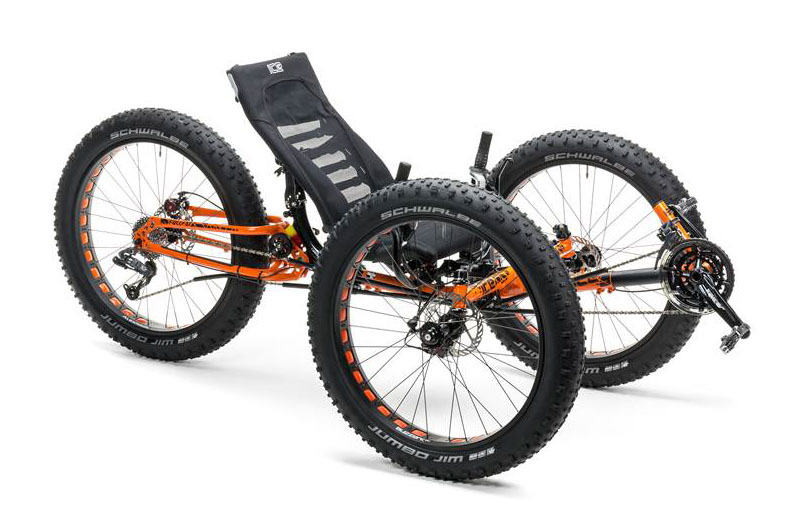 The ICE Full Fat 26FS is a recumbent fat trike that evolved from the custom trike ICE built for a ride across Antarctica to the South Pole in December 2013. 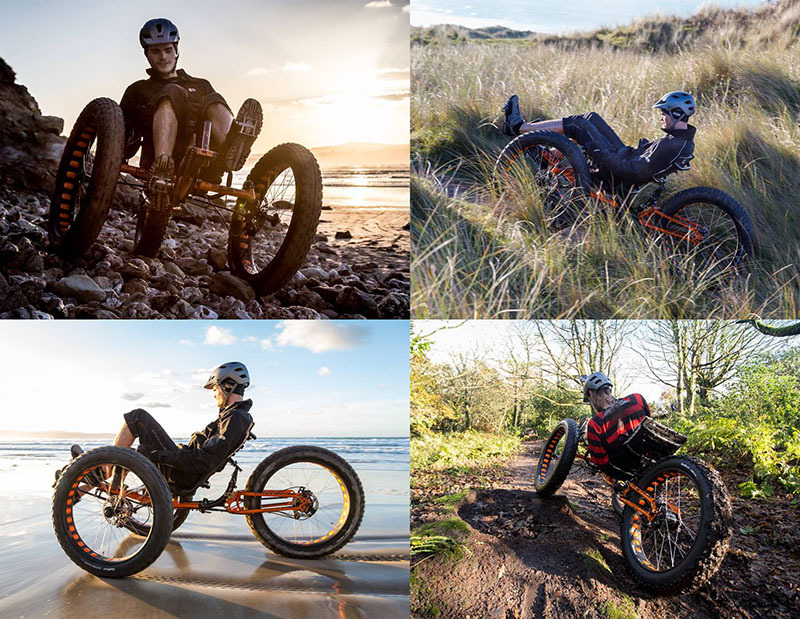 The full suspension trike is built for expeditions with oversized 26 inch rims and 4.7” (front), 4.8” (rear) tires. It features a Rohloff XL 14-speed hub based drivetrain, and a 4130 chromoly frame that can be folded for easier transport to the trailhead. This is definitely not a mainstream machine, but based on the number of photos on Twitter and Instagram, it does seem to be a crowd favorite at the show.